Take 10 for English is the latest addition to the hugely popular Take 10 Languages series and will enable young learners of English to develop their language skills whilst having fun and keeping fit. By taking part in a variety of fun physical activities including action songs, skipping rhymes, playground games and traditional dance, demonstrated on two DVDs, children improve their listening and speaking skills in English. The unique Take 10 method energises the whole brain and improves learners' mental and physical fitness. 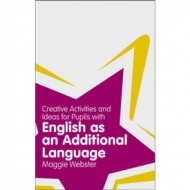 English as an additional language (EAL) students in UK schools. This resource will also help children to learn about traditional British culture and the daily lives of children in the UK. Take 10 for English is aimed at primary-school aged children (approx 5 - 11 years) who are learning English as an additional language.